Travelling around this great country we frequently come across great examples of the pioneering determination of our early European settlers. 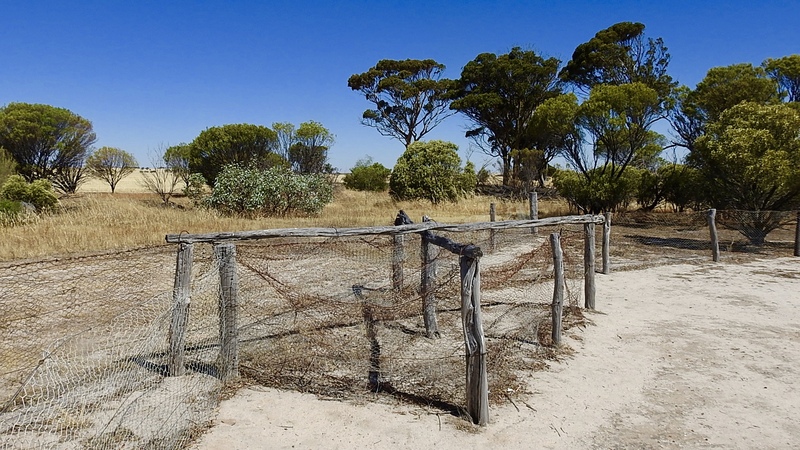 The rabbit-proof fence, which was built in the early 1900s, showcases this pioneering spirit and determination and as we tour the wheat-belt region of West Australia we have seen a number of examples of the fence. The fence was built in three-stages, commencing in 1901 and finished in 1907, and was once the longest fence in the world. A farmer, in the State of Victoria, imported 24 rabbits from England in 1859 to breed on his property for hunting. Perhaps it seemed like a good idea at the time, but before long they had reached plague proportions – action was needed to stop the spread of the furry creatures. Integral to the design of the fence were the “traps” that were erected approximately 5-miles apart along the fence line. They were 12 feet long, 7 feet wide and 3 feet high and entirely enclosed in rabbit netting. At each end and up against the main fence wire netting funnels lead into the trap. Leading out from the funnels at each end of the trap – and at an angle of 45 degrees to the main fence were two wing fences. The stray rabbits running along the fence would get caught in between the wing and the yard trap, move through the funnel of wire into the trap and couldn’t escape…! Needless to say I suspect many of the trapped rabbits made their way into some very delicious stews! Rabbits, dingoes and now they’ve started a feral cat fence electrified of course! Well plenty of feral cats out there these days…we’ll see how that works out…! I’m pretty sure those feral cats will win, they’ll figure out how to disconnect the power! What a project it was. Was it as effective as they hoped it would be? They are still around, s perhaps mixed success…! Interesting!! Happy new year to you, Janet and Thomas. “Seemed like a good idea at the time”. I know that was said over here prior to many imported species becoming invasive, like Nutria. I think Australia banned their importation just in time. Happy New Year to you, Janet and TomO, too!